In October, I wrote about a “separation” that had taken place in currency markets between the “sick” currencies and the “healthy” currencies. At the time, I argued that the former category was comprised mainly of the Dollar and the Pound, with most other currencies healthy by comparison. While I still stand by this paradigm, I would like to revise it slightly. Specifically, I would like to add the Euro and the Yen to this list. The fiscal problems of the US and UK governments as well as the debts of their citizens and companies have long been famous. For that reason, when the sick/healthy paradigm was first proposed, they were the two most obvious candidates. Having conducted some additional analysis, it’s now patently obvious that the same problems affect the EU and Japan. Given that their economies are also in weak shape, it doesn’t really make sense to group them in with the healthy currencies. Canada (and the Loonie, by extension) is also looking sickly, with its surging national debt and record budget deficits. The only reason it is being spared from the list is because of its richness in natural resources; in other words, it has something tangible that it can use to pay its debts. There is also a correction that is taking place within the group of sick currencies. Investors have come to realize belatedly that a Dollar sell-off doesn’t make any sense against the Euro and Yen, whose economic and fiscal situations could hardly be characterized as healthy. “Against the majors, we’re pretty close to the end, if we haven’t already reached the end of a bear market in the dollar,” asserted one analyst. Given that the Dollar’s demise had all but been taken for granted, this reconsideration isn’t coming natural. Volatility has surged to a 3-month high, and investors are responding by moving funds back to the US. Among the majors, then, it looks like the Dollar is still the “least worst” currency. 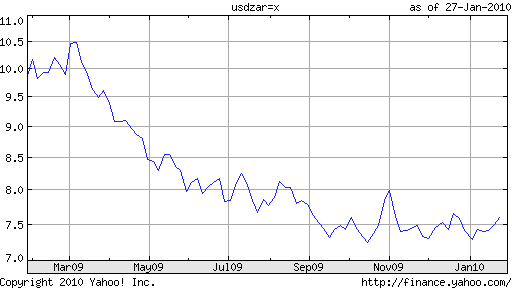 In 2009, the South African Rand was the world’s second best performing currency, after only the Brazilian Real. Since September, however, it has stagnated, and over the next year, it is projected to fall 10%. What happened?! The Rand represents an interesting case study because it sits at the nexus of several trends. The first is the movement of funds into currencies with high interest rates. (The benchmark rate in South Africa is 7%). The second is the movement of funds into economies that are rich in natural resources. (South Africa is the world’s largest producer of platinum and the third largest producer of gold). The third is the movement of funds generally into emerging market economies. (South Africa’s economy was one of the world’s strongest [perhaps least weak is more apt] economies in 2009). Thus, we should ask whether then Rand’s stagnation and projected decline is due to unique circumstances, or if instead it represents a reversal of one or more of these trends. Let’s start by looking specifically at South Africa. First of all, natural resource prices (gold and platinum) remain buoyant. Gold, as most of you are probably aware, is still hovering close to its (nominal) all-time high, while the price of platinum has resumed its upward trend, and is arguably closer to is all-time high than oil. In short, the pessimism can’t be explained by commodity prices. How about interest rates? Well, South African rates are among the highest in the world. Despite a handful of cuts totaling 500 basis points over two years, the benchmark rate still stands at a healthy 7%, which is significantly higher than its counterparts in the developed world. Unfortunately, inflation in South Africa is also quite high (6%), which means real interest rates are closer to 1%. In addition, while Central Banks in other countries are contemplating raising rates, South Africa hasn’t ruled out cutting its benchmark further. What about the fact that South Africa is considered to be one of the world’s vanguard emerging market economies? Well, this too, looks shaky. 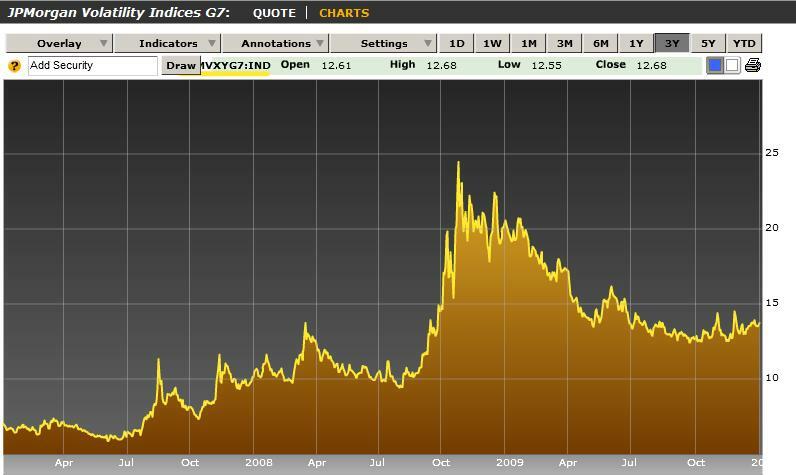 In contrast to the modest contraction in 2009 that made it a standout, 2010 may not be so kind. Analysts are expecting growth of only 2% in 2010, near the bottom of all economies, emerging market and industrialized. The US economy is projected to grow by 2.6%, in comparison. With the exception of commodity prices (and perhaps the World Cup), there really isn’t much to be excited about when it comes to the South African Rand these days. For those looking for a growth play, South Africa isn’t it. For those employing a carry trade strategy, the Rand is also not an attractive candidate, since the positive interest rate spread it enjoys (small in real terms and shrinking) is hardly enough to compensate for the risk of currency depreciation. Those looking at Rand technicals (forgive me for not citing specifics here) must be worried that the Rand’s monumental surge in 2008 could only be followed by a correction. Not to mention the fact that various political factions in South Africa are calling for the Rand to be pegged to the Dollar at a rate 33% higher than current levels. When you consider also that asset prices in emerging markets are now stalling, as investors fret about possible bubbles and contemplate bringing cash “home,” and also that the carry trade is slowly falling out of favor, it’s no wonder that analysts are gloomy about the Rand’s near-term prospects. 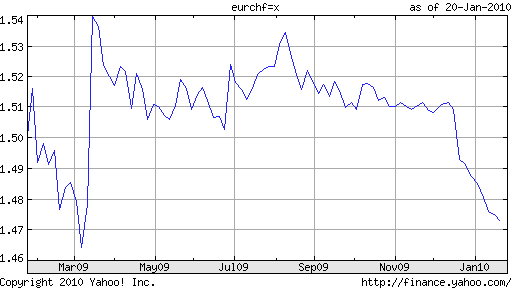 Pull up a 1-year chart of the Euro against the Swiss Franc, and you’ll quickly notice a salient trend: the exchange rate has hovered slightly above €1.50 since last March, with three notable deviations. The first occurred last March, when the Swiss National Bank (SNB) intervened in currency markets on behalf of the Swiss Franc, causing the Franc to shoot up instantly by more than 5%. The second took place in June, when the SNB threatened (it may or may not have actually intervened) intervention again, and the Franc shot up in order to create a buffer zone. The final deviation can be seen at the end of December, when a generalized decline of the Euro also manifested itself against the Swiss Franc, as it fell significantly below the €1.50 threshold. It’s not clear whether €1.50 was ever conveyed by the Swiss National Bank explicitly, or whether it was merely accepted implicitly by the forex markets. Regardless, traders certainly respected this boundary, and for most of 2009, dared not challenge it. At the end of December, as I said, there were two important developments, which bore on the EUR/CHF cross. First, credit downgrades and the (far-off) prospect of sovereign default in the EU set loose a wave of panic, after which the Euro has generally fallen. The second development was a subtle change in the wording of the SNB’s forex policy. Previously, it had promised to prevent any “appreciation” in the Swiss Franc, whereas now it is only interested in stopping an “excessive” appreciation. It’s not clear whether the Swiss Franc suddenly blasted through the €1.50 because investors believe(d) it was undervalued, or if instead it merely got caught up in the Euro’s weakness. Perhaps, investors realized that now they had an excuse to sell the Euro and no longer had to worry about whether actually doing so would risk provoking the SNB. It was probably a combination of both. For its part, the SNB (through its President and chief mouthpiece Philipp Hildebrand) is already sending subtle clues to the forex markets about the Franc’s prospects. Hildebrand recently told reporters both that “Raising interest rates would be inappropriate,” and “Since the recovery is still fragile, the current expansionary monetary stance will need to be maintained until the recovery strengthens and deflationary pressures recede.” In other words, those that bet on Franc’s appreciation shouldn’t expect any return on their investment, in the form of higher interest rates. In all likelihood, the Franc will continue to hover around €1.50, only below that barrier, rather than above it. As long as the Franc remains basically stable, either in literally not moving, or in appreciating at a snail’s pace, the SNB probably won’t get involved. After all, the change in wording to its forex policy is a tacit admission that €1.50 is arbitrary and that perhaps the Franc could stand to gain a little bit, especially in the context of the EU fiscal issues. Not to mention that intervention is expensive and ineffective in the long-term. If traders really get ahead of themselves, though, Hildebrand has already proven that he’s not afraid to act. Gold and the Euro? I thought it was Gold and the Dollar?! Let me preface this post, by noting that I try to avoid writing about gold, since there are some many other excellent analysts out there writing about the subject. But when there is a such a strong overlap between gold and forex markets, well, I just can’t resist! Recently, gold prices have collapsed at virtually the same rate as the Euro, with the result being a near-record high short-term correlation between EUR/USD and gold prices. This has caused no shortage of confusion among gold-watchers, which are accustomed to seeing the strongest (inverse) correlation with the US Dollar. This change is causing everyone to rethink some classically held assumptions about gold prices. The foremost of which is that gold is chiefly a hedge against the Dollar, which is a symbol for inflation and erosion of value. [In fact, analysts argue that gold has little real purpose (besides a handful of trivial practical uses, such as jewelry), especially since holders of gold don’t receive interest, there is little reason to own it other than as a store of value]. 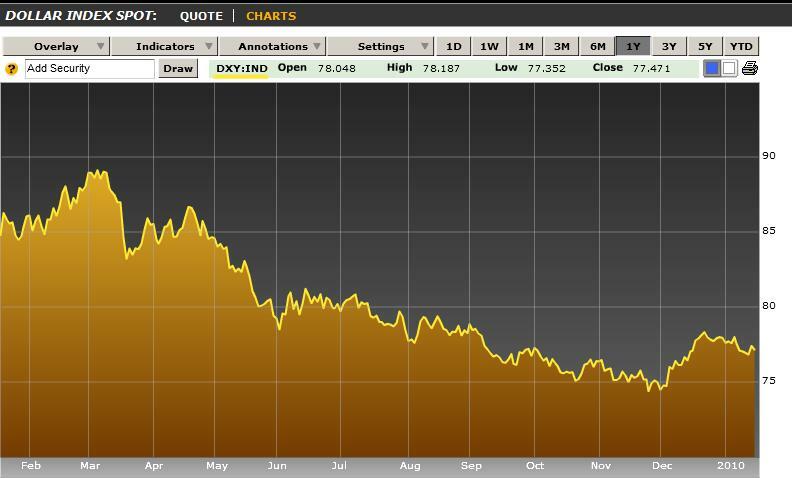 Thus, as the Dollar has declined over the last five years, gold has soared. Investors who are nervous about perennial budget deficits in the US and the skyrocketing national debt, have turned to Gold because of the belief it will continue to hold its value even (or especially) if the US government is forced to devalue its debt by devaluing the Dollar. While this tenet underlies the gold/Dollar inverse relationship, the long and short of it is that investors typically buy gold when the Dollar falls, and vice versa. Thus, when the credit crisis struck and the Dollar rallied, gold prices fell, despite the fact that the US was now more likely to default on its debt. 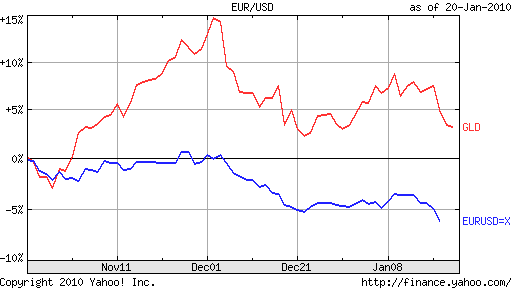 In the last month, however, the Euro has taken center stage in dictating the price of gold. This is most likely because of the sovereign debt problems of certain EU countries. A not insignificant number of which well exceed the budget (not to exceed 3% of GDP per year) and debt (not to exceed 60% of GDP) limitations imposed on them by their membership in the EU. Recent credit rating downgrades have underscored an increasing likelihood of default, which has been duly noted both by the forex and gold markets. As the Euro has dropped (quite dramatically in fact), so has gold. According to the current paradigm, this is not wholly unsurprising, since the Euro’s fall has naturally been mirrored by a rise in the Dollar. Thus, if you continue to look at gold prices in terms of the Dollar, it seems naturally that a rising Dollar is being accompanied by falling gold. On the other hand, the fact that the Dollar is suddenly rising has little to do with a change in US fundamentals, and instead reflects the fact that in forex, it’s impossible to short all currencies simultaneously, even if sometimes fundamentals would justify such an approach. In other words, that certain EU member states are more likely to default on their respective debt obligations has limited bearing on whether the US will also default. [If anything, it increases the likelihood, since a default in the EU would likely send sovereign borrowing costs higher around the world, straining the ability of the US to continue borrowing]. By extension, the current drop in the price of gold is fundamentally irrational, especially when viewed relative to currency markets. To borrow a hackneyed expression, perhaps it’s time for a paradigm shift. I try not to editorialize much when writing this blog. There are too many talking heads as it is, which is why I try not to interject own opinions into the facts. Admittedly, the notion of facts in forex is obviously a bit murky, but I stand by my approach, nonetheless. Today, I would like your permission to stray from the facts (well, not entirely) and offer my opinion on the recently proposed regulatory overhaul for trading forex. For those of you who haven’t been following this story, let me give you an overview. On January, the U.S. Commodities Futures Trading Commission (CFTC) proposed a set of sweeping changes to the rules that currently govern forex trading in the US. Among the changes are beefed-up requirements for forex dealers which would be legally required to register with the CFTC as “retail foreign exchange dealers”, and satisfy certain capital adequacy requirements, aimed at mitigating counter-party risk (i.e. dealer bankruptcy.) In addition, “introducing brokers,” (i.e. those that act as intermediaries between customers and dealers) would be required to sign exclusivity agreements with dealers, who would in turn be required to vouch for their brokers. Last, but not least, would be a bombshell change that would shrink leverage (i.e. raise margin requirements) to a maximum of 10:1. Personally, I am inclined to agree with Denninger (though not his flawed math, nor his erroneous tirade against rollover fees), on the grounds that transparency – especially with regard to commissions, which are dissimulated and ultimately buried in spreads – can only benefit customers. In addition, requiring all brokers and dealers to register, while strengthening the CFTC’s jurisdiction over forex will surely go a long way towards minimizing fraud, which remains rampant and in disguise, even among major brokers. Interestingly, industry lobbyists have come out in tepid support of this measure, but only because it will also raise the barriers of the entry. As for the clause that aims to limit margin – and is really the only one that anyone is seriously protesting – this is also a step in the right direction. While libertarians and the 1% of traders that have turned a profit employing 100:1 leverage (the current U.S industry standard) will surely disagree, I think that sometimes, people need to be protected from themselves. I don’t want to frame this debate in political terms, however, since at the end of the day, such high leverage is both de-stabilizing to the market, and unnecessary. It’s destabilizing, because of the massive speculation it invites, and its resulting contribution to volatility and systemic risk, and unnecessary because it’s impossible to produce a viable trading strategy that’s built on borrowing 100 times as much money as you are able to commit. For the sake of comparison, consider that the average hedge fund, its reputation for excessive risk-taking not withstanding, will rarely employ leverage greater than 2:1. How about another comparison: Has 100:1 leverage (i.e. 1% down-payment) been good for the housing market, from both the standpoint of individual and society? As for the argument that retail traders will instead send their money off-shore to gamble (cough, I mean trade), well I suppose that’s possible. But given that a related piece of recent regulation has been very successful at preventing Americans from patronizing offshore casinos, I’m sure the government can ensure a high rate of adherence with this piece as well. But obviously, this too, is a highly charged political issue, and it’s probably not practical to examine forex from this angle. In the end, I think the government has (rightly) identified retail forex as the casino it is, and is finally taking steps to make it legitimate. For regular readers of the Forex Blog and those that follow its implicit approach (i.e. not churning your portfolio on a daily, or even weekly basis), I am confident that this regulation, if approved, will NOT adversely affect you. As for everyone else, maybe it’s time to either re-think your strategy, or ask yourself whether trading forex is still right for you. 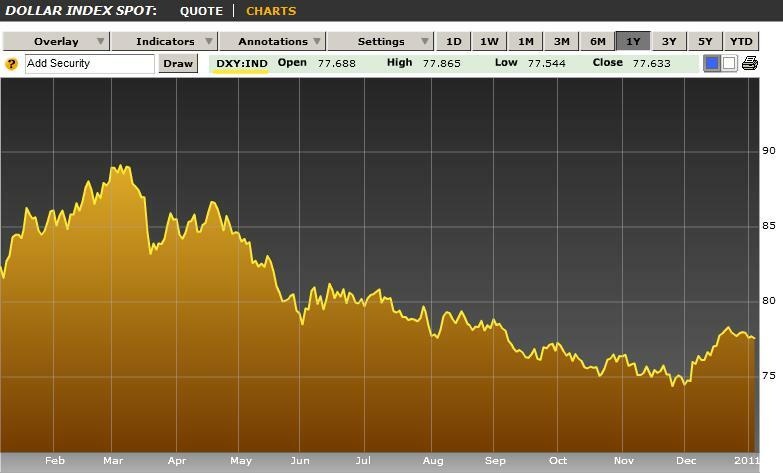 After the impressive rally in the US Dollar at the end of 2009, many market observers predicted that the end was near for the Dollar carry trade. That’s because volatility is the sworn enemy of carry traders; whenever there transpires a sudden change in direction in a funding currency, investors will usually race for the exits, regardless of whether the change was justified by fundamentals. Alas, 2010 has seen a stabilization – even a modest appreciation – in the Dollar, which means the carry trade is here to stay. For now at least. This is based on two abiding notions. The first is that US short-term interest rates – and, hence, borrowing costs for carry traders – will remain low for the foreseeable future. The second belief is that the most attractive investment opportunities can still be found outside the US, namely in emerging markets. Let’s explore both of these ideas in greater details. In short, investors are rapidly scaling back their expectations for interest rate hikes; futures prices now reflect a mere 20% of a hike by the Fed’s June meeting. If Bullard’s comments carry any weight, investors might turn their attention to the other tools in the Fed’s arsenal- namely quantitative easing. A rise in inflation, portended by many economists, could spur the Fed to draw money out of the markets by selling some of its $1 Trillion in credit securities. Regardless of what it decides on this front (expand, hold steady, rein in), however, the long and short of it as that interest rates aren’t going anywhere anytime soon. And that means funds will remain cheap and available for carry trading. On the other side of the equation is an enduring optimism in emerging markets. The last decade has been very kind to investors that bought emerging market stocks, returning a “modest” 100% in some cases and an incredible 1000% in others. The S&P, in contrast, declined slightly over the same period. In some ways, 2009 was a microcosm for this trend, as the MSCI emerging markets index gained 73%, compared to 25% in the S&P. While investors are cautious about bubbles forming in some of these markets (bubbles seem to form and burst with alarming regularity), they continue to pour money in. $75 Billion was added to emerging market equity funds in 2009, to be precise. They are buoyed by predictions that emerging markets will account for the lion’s share of global GDP growth going forward. This has facilitated a twist on the carry trade, whereby investors are now commonly using Dollar-funded loans to buy stocks, rather than sit back and earn a modest return investing in comparatively low-risk interest-bearing securities. This “traditional” carry trade is perhaps less popular now because interest rates are at all-time lows in many countries. But this is already starting to change as a healthy recovery in emerging markets has paved the way for rate hikes. While this could put a damper on stocks, it would re-open the bread and butter for carry traders, which is to sit back and earn a simple interest rate spread. Moreover, these carry traders can rest assured that if/when the Fed eventually raises rates, Central Banks in Asia and Latin America will almost certainly be in the same position. The main threat at this point is uncertainty. “Investors plying the carry trade should tread cautiously — economic data will continue to be volatile, as befits a recovery that will proceed in fits and starts,” summarizes one columnist. In short, while fundamentals continue to support a carry trade strategy, it could be undone (rapidly) by an uptick in volatility. Forex Reserves in Transition: Is the Euro Making a Run? With so much to think about these days, I havn’t spent much time poring over foreign exchange reserve statistics. Apparently, this is to my detriment, as there have been a number of important developments on this front, some of which carry far-reaching forex implications. I’m guessing a lot of you are probably in the same boat as me, wondering why forex reserves are worth paying any attention to. While busy looking at complex charts and GDP/inflation statistics, however, we forget that a currency’s value is fundamentally determined by supply and demand. In other words, while bullish/bearish indicators and interest rates are the proximal factors behind forex, the supply/demand dynamic is the ultimate factor. And Central Banks, collectively, comprise one of the largest contingents behind this supply/demand. The wild card is China. I use the term wild card both because China’s forex reserves are the world’s largest (recently confirmed at $2.4 Trillion) and hence whatever it decides will have major implications, and because it does not report the specific composition of its reserves to the IMF, so it’s unclear how it’s outlook is changing from month to month. Plus, it offers only vague indications of its intentions, so all we can do is speculate. But speculate we will! While China has publicly maintained its support for the Dollar, quasi-publicly, there is an abundance of concern. This has most recently manifested itself in the form of internal calls for China to use its hoard of reserves to buy natural resources abroad. This wouldn’t necessary involve large-scale selling of its Dollar-denominated assets – since most oil contracts, for example, are still settled in Dollars – but would certainly involve shedding some of them. As for why Central Banks are dumping Dollars (or simply choosing not to accumulate more of them), that seems pretty obvious. Even ignoring the Dollar’s problems, a well-balanced portfolio is an exercise in risk management. Especially now that many of the Dollar’s rivals are as liquid and as stable as the Greenback, itself, it makes little sense to put all one’s eggs in one basket. Only a year ago, who could have conceived of such a possibility? At the time, the Canadian Dollar (aka Loonie) was in the doldrums, as a result of the credit crunch and concomitant collapse in commodity prices. In March, however, the Loonie began an extraordinary rally, and finished the year up 16%, almost perfectly offsetting the record decline that it suffered in 2008. 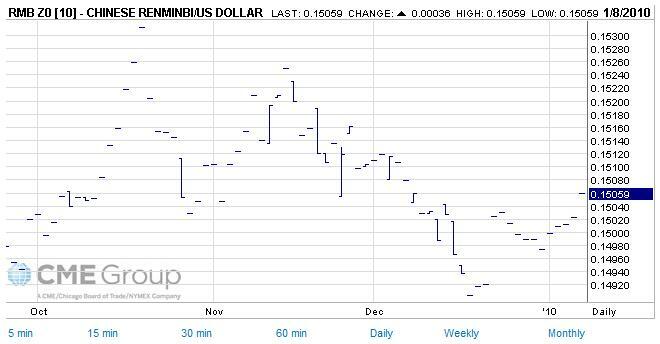 As a result, the Loonie is now only pennies away from returning to parity. The Loonie’s rise can be ascribed to a combination of fundamentals and speculation. On the fundamental side, a surge in the price of oil and other commodities has driven a recovery in the Canadian economy. Summarized one strategist, “The fundamentals in Canada are strong. Sentiment is bullish Canada, and on a relative basis, Canada should do very well with stronger commodity prices and ongoing U.S. economic recovery.” On the other hand, non-commodity exports remain sluggish, such the current account balance is currently in the red. It’s obvious then that the gap between reality and expectation is being filled by speculation. Despite the fact that both short-term and long-term Canadian interest rates remain low, investors are pouring money into Canadian assets in the hopes that rates will soon rise. This speculation reached a fever pitch in October of 2009, when the Loonie spiked 6% in less than two weeks, following a modest Australian rate hike. At that point, Canadian Central Bank governor Mark Carney was forced to firmly step in (previously he had effectively remained on the sidelines) by warning investors that he was in no hurry to lift rates, and that “he had ways of cooling the currency.” While analysts credit Carney’s jawboning with effecting a modest decline in the Loonie, it has since resumed its upward march, breaking through the technical barrier of 97.5 CAD/USD yesterday. In the short-term, sheer momentum will almost surely carry the Loonie through parity with the Dollar. Analysts are divided on the timing, with some suggesting as soon as this month and others suggesting that later in the year is more likely. They should be careful, as there is an exuberance in the forex markets that I havn’t seen since right before Lehman Brothers collapsed- the event that many say signaled the beginning of the forex markets. In other words, investors are surely getting ahead of themselves, since commodities are well off of their 2008 highs, interest rates are down, Canadian economic growth is mediocre, Canada’s fiscal condition is weak, and it is operating a current account deficit. For this reason, many analysts are already becoming bearish on the Loonie. “The loonie looks potentially more vulnerable on a number of crosses unless we see renewed upside momentum,” expressed a strategist from RBC Capital Markets. But noticed that she framed a continued rise in terms of momentum, rather than fundamentals. That’s tantamount to saying, Unless the Canadian Dollar continues to appreciate, it won’t continue to appreciate. If that’s not a tautology, I don’t know what is! But seriously, she has a point, which is that the Loonie is being driven purely by speculation at this point, in a trade that could soon come crashing down…after it hits parity. Last week, Hirohisa Fujii resigned as finance minister of Japan. Since Fujii was an outspoken commentator on the Japanese Yen, the move sent a jolt through forex markets. Those who were expecting that his replacement, Deputy Prime Minister Naoto Kan, would be be more consistent than his predecessor were quickly disappointed, as Mr. Kan managed to contradict himself repeatedly within days of assuming his new post. On January 6, he said it would be “nice” to see the Yen weaken, going so far as to designate 95 Yen/Dollar as the level he had in mind. 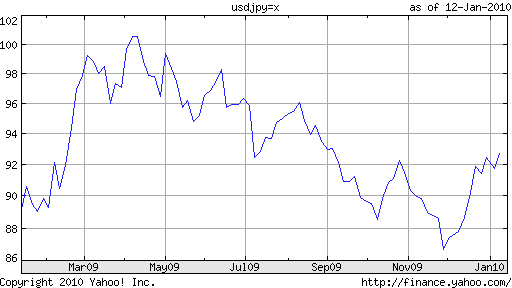 One day later, he said that the markets should in fact determine the Yen: “If currency levels deviate sharply from the estimates, that could have various effects on the economy.” After he was rebuked by Prime Minister Yukio Hatoyama, who noted that the government should not talk to reporters about forex, he went on tell US Treasury Secretary that forex levels should be stable. In short, Japan’s official governmental position on the Yen still remains muddled, and it’s no less clear whether it will – or even should – intervene. When economic growth collapsed in 1990, Japanese consumers became famously frugal, and the domestic market still hasn’t recovered. Neither has the stock market, for that matter: “The Nikkei is 44.3% below where it stood at the end of 1999. It is 72.9% below its peak near the end of 1989.” The performance of the bond market, meanwhile, has been a mirror image, rallying 78% since 1990. The resulting decline in real interest rates has combined with economic stagnation to produce a perennial state of deflation. In fact, prices are once again falling, this time by an annualized pace of 2%. What is the government doing about all of this? Frankly, not too much. It is spending money like crazy – exacerbating its fiscal state and pushing it closer to insolvency – in a (vain) attempt to prime the economic pump and avoid deflation from further entrenching. The Central Bank, meanwhile, just announced a new round of quantitative easing, also aimed at fighting deflation. 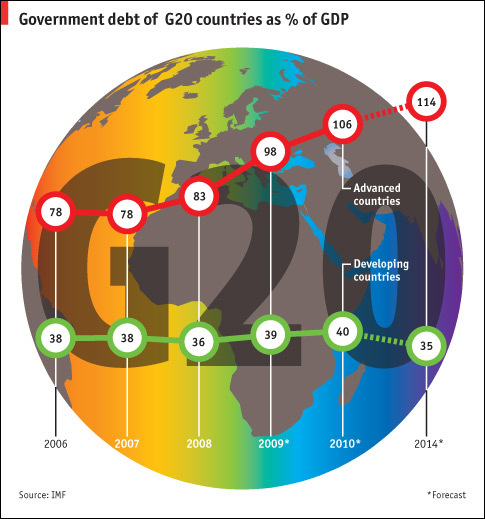 At only 2% of GDP, however, the measures are “pretty tame” and unlikely to accomplish much. Considering that its monetary base has only expanded by 5% this year (compared to 71% in the US), it still has plenty of scope to operate. At the present time, however, it is still reluctant to do so. Ironically, the aging population phenomenon could end up restoring Japan’s economy to equilibrium. The worse Japan’s fiscal problems become, the sooner it will be forced to simply print money, so as to deflate its debt and avoid default. This will stimulate the economy and put upward pressure on prices (solving two problems), and exert strong downward pressure on the Yen. The way I see it, that’s four birds with one stone! As for the Yen, then, I would expect it to hover over the near-term, since price stability and a strong credit rating don’t signal immediate catastrophe. No, Japan’s economic problems are more long-term, which means it could be a while before they more clearly manifst themselves. The Chinese Yuan (RMB) spent all of 2009 pegged to the Dollar at 6.83. Since the Dollar depreciated against almost every other currency during that time period, the Yuan has fallen against these currencies, undoing most of its appreciation in 2008. As a result of both international pressure and internal economic conditions, however, the Yuan’s stasis should come to an end soon. The only questions are when, how and to what extent. In hindsight, the Central Bank (i.e. state economic planners) of China were probably justified in holding the Yuan in 2008. At a time when forex markets (and other capital markets, for that matter) were behaving erratically, the Yuan was a baston of stability. China’s premier, Wen Jiabao, recently boasted, “Keeping the yuan’s value basically steady is our contribution to the international community at a time when the world’s major currencies have been devalued.” In fact, there is evidence that the Central Bank went against market forces in the opposite direction during the height of the credit crisis, and successfully prevented the Yuan from depreciating, thus proving that a currency peg can work both ways. The result was price stability, and a boost to exporters that had been damaged by the falloff in foreign demand for Chinese goods. With the global economy emerging from recession, the argument for maintaining the peg is becoming less tenable. China’s economy, itself, grew at an impressive 8.5% in 2009, and is forecast to grow even faster in 2010, by 9.5%. Thanks to a surge in bank lending and the government’s massive economic stimulus program, inflation is also ticking up. It has been approximated at 2.5%, but is contradicted by spikes of 50%+ in the prices of certain staple goods, and certainly doesn’t take into account the rise in asset prices. 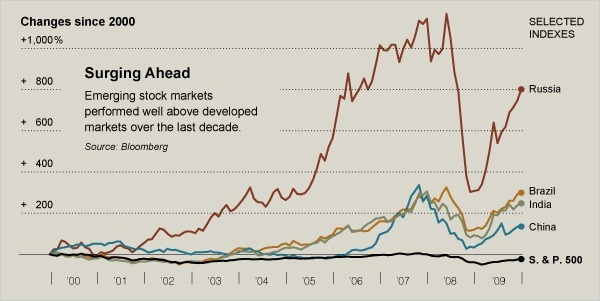 China’s benchmark stock market index surged 90% in 2009, and property prices increased by 30% in some areas. The dual concerns, of course, are that the money supply is expanding too fast and that bubbles are forming in certain asset markets. The weak RMB is certainly not helping either. Thanks to relaxed capital market controls and expectations of further appreciation, speculative “hot money” is once again pouring into China. Holding down the Yuan in the face of such pressure is becoming prohibitivel expensive: “China’s foreign-exchange reserves climbed 17 percent in the first nine months of 2009 to $2.27 trillion, the world’s largest holdings.” Some of the demand is naturally being tempered by bubble concerns, but the trend is still money coming into China. There is also the argument, much mooted in economics circles, that an appreciation of the RMB would be good for the Chinese economy. Because of a perennially weak currency, its economy has become to addicted to exports to drive growth. “As a report from research firm Euromonitor International notes, in U.S. dollar terms, China’s consumer market lags those of the U.S., Japan and much of Europe, with private consumption just over one third of GDP in 2008.” This is probably a product of social and cultural forces, which still emphasize saving. Skeptics of the usefulnes of RMB appreciation point out that rebalancing the Chinese economy would start with changing the culture of saving, but a stronger currency would certainly provide a powerful incentive. Not to mention that a more valuable RMB would give Chinese companies more leverage in consummating outbound corporate M&A deals and natural resource acquisitions that they have been so keen on in recent years. On the other side of the debate are skeptics of a different sort- those that think RMB appreciation is justified by forward-looking macroeconomic fundamentals. Some fear hyperinflation of the sort that China faced in 2007 and was only brought under control by the global economic recession and concomitant decline in resource prices. “Franklin Allen, a professor of finance at Wharton [University of Pennsylvania], estimates the likelihood of inflation reaching between 10% and 20% to be around one in five.” Any inflation beyond what is experienced in other economies would have to be reflected in the RMB. In a hyperinflation scenario, the Central Bank might even have to deliberately depreciate the currency. 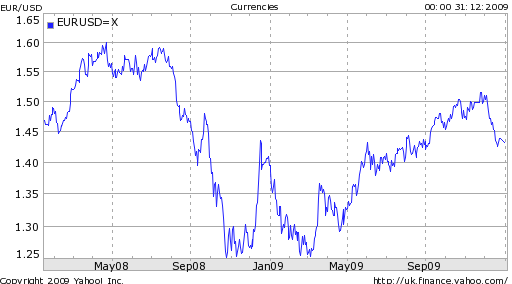 I thought it would be fitting to follow up my last post (Forex in 2009: A Year in Review), with one that looked forward. And what better way to do that then by squarely examining the US Dollar, which is still the undisputed heavyweight champion of forex markets, and from which most other forex trends can be ascertained and comprehended. December (I know I said I wouldn’t look backwards, but come on, a little context is necessary here…) was the best month for the Dollar in 2009. From December 1 to December 31, it rose 4.7% against the Euro and 7% against the Yen, as part of an overall 4.8% appreciation against a basket of the world’s six other major currencies. “The dollar rally which has taken place in December is significant in that it has brought an end to the powerful downtrend which had been in place since March following the Fed’s decision to begin quantitative easing,” summarizes one analyst. As a result of the Dollar’s strong turnaround in December (and the forgotten fact that it actually appreciated in the beginning of last year), the broadly weighted Dollar Index finished 2009 down a modest 4%. Analysts summarized this turnaround using a few main paradigms. The first was that logic had returned to the forex markets, such that the negative correlation between equities (which serve as a broad proxy for risk sensitivity) and the Dollar had broken down [See earlier post: “Logic” Returns to the Forex Markets, Benefiting the Dollar]. As a result, good economic news was once again good for the Dollar. The second interpretation was a direct contradiction of the first, and argued that the Dubai debt bomb, coupled with credit scares in Europe, had in fact increased risk aversion, and reinforced the notion that the Dollar is still a safe haven [Edward Hugh mentioned this in my interview of him]. The third theory represents a slight twist on the first one- that concern over Fed interest rate hikes will shift interest rate differentials and cause the Dollar carry trade to break down. Technical analysts, meanwhile, argue that the Dollar had been oversold, and that the year-end rally was merely a product of the closing of short positions and profit-taking. The key to predicting how the Dollar will perform in 2010, then, largely rests in correctly discerning which paradigm currently underlies the forex markets. Let’s begin by comparing the first possibility – that good economic news will be good for the Dollar – to its antithesis – that the Dollar remains the safe havens. I think two WSJ headlines can shed some light on which interpretation is more accurate: Dollar Rises On Lower Demand For Riskier Assets and Dollar Slumps As Investors Snap Up Risky Assets. In other words, the market logic is that the Dollar is still a safe-haven currency, to the chagrin of market fundamentalists. With regard to the notion that the Dollar is being driven by expectations that the Fed will tighten monetary policy at some point in 2010, that seems to have some traction. The markets have priced in a 60% possibility of a Fed rate hike by June, and a majority of economists (9 out of 15 surveyed) think that the Federal Funds rate will be higher at the end of the year. This optimism is a product of the last month, which saw strong improvements in non-farm payrolls, housing sales, durable goods orders, ISM supply index, and more. Some of these indicators are now at their highest levels since 2006; “That speaks better about the health of the U.S. economy and that could help move up the timetable for the Fed to boost interest rates,” goes the accompanying logic. That investors believe the Fed will hike interest rates and that it will be good for the Dollar is not so much in dispute. Whether investors are right about rate hikes, on the other hand, is less certain. To be sure, momentum is growing in the US as the economy shifts from recession to growth. While current data is unambiguous in this regard, the future is less certain. A vocal minority of analysts argues that the apparent stabilization is largely due to government incentives. When these expire, then, the result could be a double dip in housing prices, and a second act in the economic downturn. The result, of course, would be a delay and/or slowing in the pace of Fed rate hikes. Some economists predict that that Fed will indeed hike rates in 2010, but only incrementally. Others have argued that it won’t be until 2012 that the Fed lifts its benchmark FFR from the current level of approximately 0%. Instead, the Fed will first move to withdraw some of the liquidity that it unleashed over the last two years, of which an estimated $1.1 Trillion still remains “in play.” Such would be directed primarily at heading off inflation, and wouldn’t do much for the Dollar. Regardless, the implication is clear: “The fate of the dollar is in the hands of Ben Bernanke. If he begins the exit process and starts to raise interest rates, the dollar will perform okay this year.” If he stalls, and investors accept that they may have gotten ahead of themselves, well, 2010 – especially the second half – could be a sorry year for the Dollar. In some ways, 2009 was a wild year in forex markets. Compared to 2008, however, it was relatively tame. 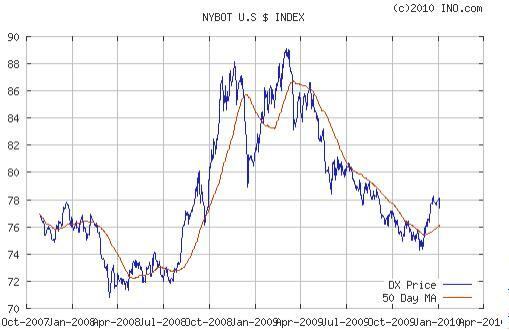 And that is all I have to say about forex in 2009. The year began as a continuation of 2008. Global capital markets were still in the throes of the credit crisis, and risk aversion was in vogue. Investors continued to remove funds en masse from virtually every economy – with an emphasis on emerging markets – and parked the proceeds in the US. More specifically, they put the proceeds in US Treasury securities. US corporate bonds and equities declined, as did interest rates, to such an extent that short-term rates briefly dipped below zero. As this trend gathered momentum, the Dollar continued its rally against virtually every currency, with the notable exceptions of the Swiss Franc and Japanese Yen. For reasons related both to the unwinding of the Japanese Yen carry trade and the bizarre perception that Japan was also a safe haven against the storm of the financial recession, despite the fact that its economy contracted by the largest amount of perhaps any economy due to its reliance on exports. Against other currencies, the Dollar was nothing short of brilliant, surging 30% against many emerging market currencies, and 50% against the Korean Won, from trough to peak. Some analysts predicted that it was only a matter of time before the Dollar reached parity with the Euro. But it wasn’t to be, as the Dollar never topped $1.25 against its chief rival. The markets pulled an abrupt about-face in March, and began a rally that would last 8 months (and might still be in progress, depending on who you talk to). The S&P 500 rose by more than 50%, impressive, but still paling in comparison to emerging market equity prices. As investors grew more and more comfortable with risk, they reversed the flow of funds, and bond spreads between the US and the rest of the world gradually declined. 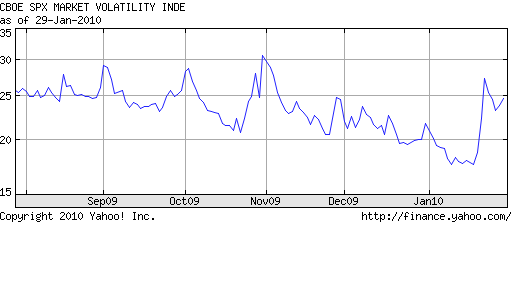 More importantly, so did volatility. For the forex markets, that meant a rapid appreciation in every single currency against the Dollar. Around the same time, the Swiss National Bank (SNB) intervened for the first time (it would intervene again in June) in forex markets, ostensibly to guard against deflation. As a result, the Swiss Franc has largely been exempted from the forex rally which sent the Euro up 15%, the Brazilian Real up 35%, and the Australian and Canadian Dollars back towards parity with the the US Dollar. After a modest rally, the British Pound stabilized around pre-bubble levels, due to concerns about the UK’s quantitative easing program (i.e. wholesale money printing), and consequent impact on inflation and the British national debt. Similar concerns have plagued the US Dollar, but interestingly have spared the Euro and Canadian Dollar, despite the fact that their respective Central Banks’ response to the credit crisis have largely mirrored that of the Fed. As a result, the Pound was quickly segregated with the Dollar as a fellow “sick” currency. By the summer, currencies and asset prices had risen by such an extent that investors began to fear the formation of bubbles. Governments and Central Banks, meanwhile, grew concerned about the potential impact of expensive currencies on their nascent economic recoveries. A handful of Central Banks – many in Asia – intervened successfully to thwart the appreciation of their respective currencies, while Brazil resorted to taxes to try to stem the appreciation of the Real. The Bank of Canada threatened intervention, while the Bank of Japan was more ambiguous; investors ultimately shrugged off both, and the Japanese Yen touched an all-time high against the Dollar in November. Towards the end of the year, the rally began to lose steam as investors began to fret that they had gotten ahead of themselves. In addition, the prospect of interest rate hikes was moved to the fore, thanks to early action by the Bank of Australia. While it’s clear that the Fed won’t be moving to tighten monetary policy anytime soon, investors have been forced to re-evaluate their short-Dollar carry trade positions within this context. Meanwhile, a handful of credit market scares, first involving Dubai, and later, a handful of EU member countries, reminded investors that the recovery was both fragile and unequal. As a result of the renewed focus on fundamentals, commodity currencies and currencies backed by strong economic growth projections, continued to appreciate. The Dollar, despite comparatively weak fundamentals, also appreciated, due to its safe-haven appeal and perceptions that the Fed would be among the earliest Central Banks in the industrialized world to hike rates. Ironically, forex markets ended the year ironically just as they began (though for different reasons), with the Dollar in the ascendancy.